The text of this four-volume study is completed and typeset and, from February 2019, is being indexed. Publication is set for 23 April 2020. All four volumes will come out together. They contain more than 3000 pages, not counting the indexes. They can be bought individually or as a set. Mary Hardy and her World is built around the life of Mary Hardy (1733–1809), pictured (top) aged 51. The wife of Yorkshire-born William Hardy, a farmer, maltster and brewer in Norfolk, she recorded their home life and, notably, their working lives every day and in precise detail in her 36-year diary. Professor Richard G. Wilson celebrates her text, all half a million words of it, as “a notable addition to the long roll-call of English diaries, one of the great joys of our historical record”. 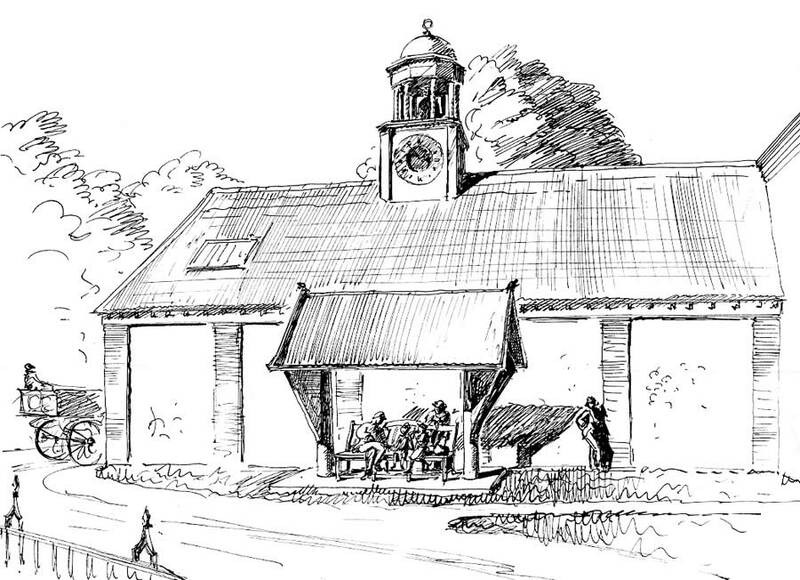 Mary Hardy’s diary opens on 28 November 1773 at Coltishall, on the waterways of the Norfolk Broads in eastern England. In April 1781 she, her husband and three children moved to Letheringsett Hall, four miles from the north Norfolk coast. Raven, William and Mary Ann were then aged thirteen, eleven and seven. Her journal ends on 21 March 1809. She died two days later and was buried in Letheringsett churchyard on 29 March. In her diary she ranges far more widely than the two villages in which she wrote. The tale she tells is buttressed in the Burnham Press edition by a wealth of illustrations. These volumes of commentary and analysis draw on her extraordinary manuscript. It is exceedingly unusual to find a woman of little formal education creating a sustained record of this magnitude. It is remarkable for both its breath and its depth. You can read Mary Hardy’s story in her own words in the Diary volumes. The commentary Mary Hardy and her World explores the context of her diary-writing. It was a world of gritty endeavour and often hardship on the land, on the road and at sea. Mary Hardy and her nephew and fellow diarist Henry Raven, writing in the same household, were not cushioned from hardship. At times they experienced it themselves. The strength of their work is that they wrote of the labouring class as well as the farming and commercial class from which they sprang. Unusually for diarists, they were not preoccupied with self in their daily entries. They were cogs in the larger mechanism—supporting the family business. 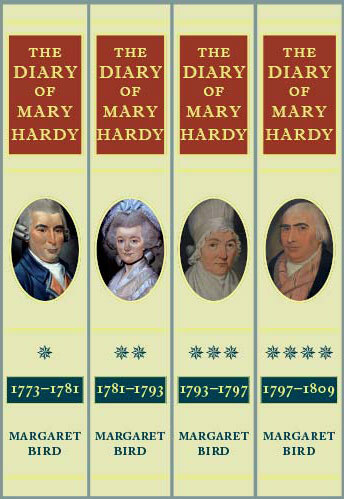 The Diary of Mary Hardy 1773–1809 was published on 30 April 2013. 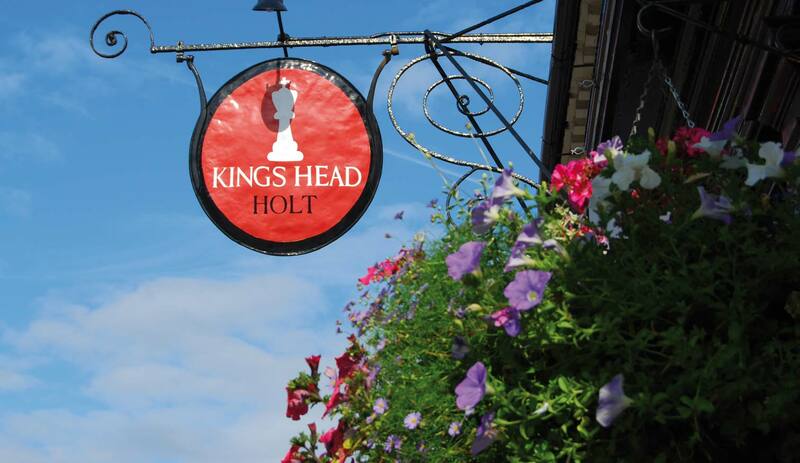 It received critical acclaim, with very favourable reviews. This major historical project has already involved more than 30 years of continuous research and writing by Margaret Bird. You can discover more here about the Mary Hardy Project. The diary is a living text, and much that was familiar to the Hardys remains with us today. The banner images on this website make the point. Here the black-sailed trader Albion passes St Benet’s Abbey on the Norfolk Broads. The Hardys built their own small wherry which regularly plied the River Bure bringing coal from Great Yarmouth. Mary Hardy gives us an eighteenth-century wherry log—just one of a series of unique resources. Some of the others will be described on this website. The long task has involved a very large number of people, notably the diarist’s descendants and members of specialist societies such as the Brewery History Society, Norfolk Industrial Archaeology Society and Norfolk Wherry Trust. You can read more about the Cozens-Hardy family under Archive Sources and see the list of societies under Links. The Acknowledgments pages in each volume of Mary Hardy and her World contain hundreds of names. Margaret Bird is extremely grateful to them all. Many of the illustrations on this website, including the one above, are from the private archive the Cozens-Hardy Collection. The publishers Burnham Press describe just some of the readers who will find the books absorbing. These studies will appeal to the general reader, to family and local historians, to the specialist, and to teachers and researchers. 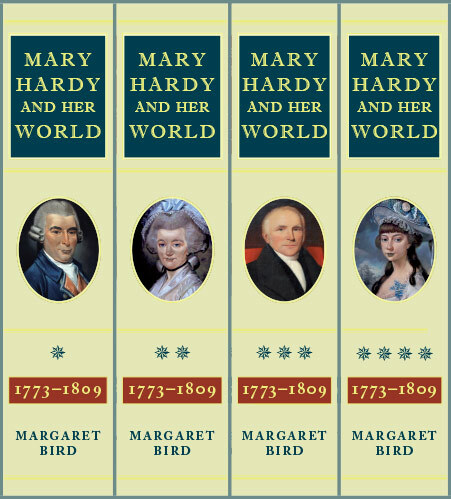 The book covers for all the Mary Hardy volumes are shown on the Home page. You can buy the Diary volumes now. The commentary Mary Hardy and her World is in course of publication. You will be able to enjoy this new work without reading her diary text. You will find its 39 subject areas listed in these pages under World Volumes. At publication you will be able to place an order—either for a single volume or for a set—from this website or from Amazon.co.uk. On publication this title will be available through selected bookshops.